With the much anticipated launch of the Red Dead Online beta tomorrow, there is now one more reason to pick up Read Dead Redemption 2. 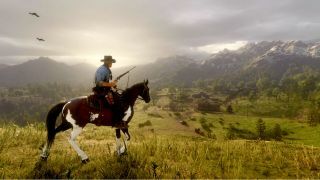 Although the beta is sadly limited to owners of the Ultimate Edition of the game, available for PS4 and Xbox One, anyone who booted up other versions of the game on the day RDR2 was released will be able to partake in the online component on Wednesday, November 28. If you bought the launch game before October 29, you’ll be able to play one month later – on November 29. Should you pick up Red Dead Redemption 2 right now, while it’s on sale, you will have to wait until this upcoming Friday (November 30) to embark on your Read Dead Online exhibition. That said, the campaign in Read Dead Redemption 2 is much longer than that of its predecessor. If HowLongToBeat is anything to go by, the main story by itself ought to take you around 40 hours to complete. Assuming you have nothing else to attend to this week, that alone could suffice as a full-time job until you do get access to Red Dead Online.